This is an HO Scale 5mm x 1-3/4" x 24' Continuous Roll of Track-Bed from Woodland Scenics. Retail $13.99 SAVE 24% ! I like the foam road bed much better than the bark and it is easy to work with. 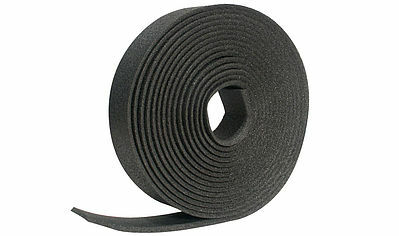 Durable non-absorbent black foam material. Conforms to all applicable NMRA standards. Sound-deadening and vibration-cushioning for quieter, smoother operation. Flexible material may be tacked or glued down and won't dry out or crumble. Great underlayment for multi-track yards, switches, loading areas and sidings. One HO Scale 5mm x 1-3/4" x 24' Continuous Roll of Track-Bed. I used this product for the track bed in my Display Cases. I have (2) 34 by 24&apos; cases where I display some of my locomotives that are not in service. The locomotives look much better than just sitting on track on a plain surface. I have just used the Woodland Scenics Track Bed for the First Time, on my HO Layout, Somerset Junction and Roanoke Rapids Rye. Have just Gotten my Benchwork Done and Starting on Hidden Return Loops First. So far The Material is Working Great. The Roadbed Has a Separation Line in the center,like Cork, but does not separate as easily...needs to be cut to separate. I did think the material would round curves without Separation, but found out differently. But when all is said and done it still lays as easily as cork, and I like the feel and look Better! Don&apos;t have any Trains Running at this point, so I Cannot Comment on The Sound Deadening Quality, but am very Hopeful it will Be as Advertised. I just Used 3 of the 24&apos; Rolls, and today ordered the 2&apos; strips, I think these will be more easily managed and separated. By the time I use the Strips I should have trains Running and will comment more on the Products. I had an ok experience with this product. On straight lines, this product goes down just fine, but on the curves there can be some issues. The foam did just as good of a job in my opinion in deadening the sound as the cork did. There is a lot in the roll for a decent price. I just wouldn&apos;t recommend this product for sharp curves.